Jonathan Buckley’s third novel opens with Alexander MacIndoe’s earliest memory: a February morning in 1944, in the aftermath of the second wave of German air-raids. Set mainly in London and Brighton, Ghost MacIndoe is the story of the next fifty-four years of Alexander’s life. We meet his glamorous mother and his father, a banker; a traumatised war veteran called Mr Beckwith with whom Alexander works for several years as a gardener; and, most important of all, the orphaned Megan Beckwith, whose relationship with Alexander crystallises into a romance in the 1970s. In the wake of his highly praised first two novels, Jonathan Buckley’s third miraculously brings into being one simple life and the last sixty years of English history. …a highly original novel, wonderfully accomplished and crafted. It is a story of the ordinary, of the everyday – even the war years are portrayed in the lowest key – yet it is a book that still manages to be compelling, moving and provocative. 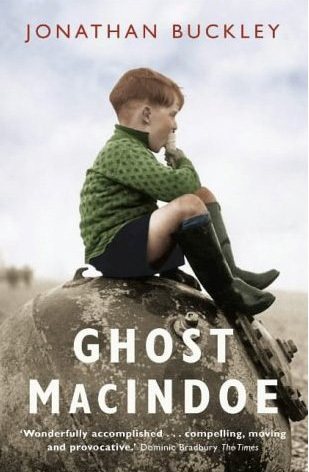 Ghost MacIndoe is a genuinely strange book, and the quality of attention Jonathan Buckley brings to his material deserves to be called poetic …makes a good deal of other contemporary fiction look empty and a bit foolish. Buckley is hugely challenging …MacIndoe is at once everyman, and not even himself. Like his lovers, readers will be eager for more insight and more depth, where no more is to be found. It takes a while to acclimatise to Alexander’s silence, but in the end there is peaceful acceptance. Perspective changes, and what once seemed a reader’s right suddenly seems like insensitive belligerence. These are the lasting resonances of Ghost MacIndoe, alongside Buckley’s obvious relish of language and his masterly use of it. Alexander MacIndoe’s life is, in the end, as exciting as most other people’s. Jonathan Buckley’s ability to make it enjoyable and interesting demonstrates a huge talent …There are few emotional peaks and troughs but the whole feels so calm and peaceful that you just want it to go on for much longer. And that is a great thing to be able to say about any novel. Buckley seems to have a limitless stock of similes, freshly coined but instantly recognisable …The mood is subdued, but the accumulated effect of his descriptions is deceptively powerful. The story is lifted by Buckley’s exceptionally vivid powers of description …the work of a writer of considerable talent.